My book clubs are ten week sessions, and we meet virtually using Zoom technology. My class is limited to 15 students because I want each student to have time to present their learning every other week. I will share some of the success and challenges of running my primary book clubs online from a guided inquiry, and design thinking perspective. My intention is to scaffold inquiry and engage students to become active problem solvers, to dream big, solve authentic problems and research with passion! The teacher role has now changed from “sage on the stage” to FACILITATOR, and the student has moved from the role of consumer to one of producer or PRESENTER. In terms of initiating the teaching parts of the guided inquiry, the teacher needs to hook his or her students in with an essential question or focus. This year I am using our BC new curriculum grade 3 science standards including the essential question, “What is an Ecosystem?” My role is to get students excited about the topic and big idea, and channel their thinking into further questions about ecosystems close to home or outside of their community. I also hope to role model the importance of what makes an essential question in science so important, and praise skills as opposed to content! How did I do this? 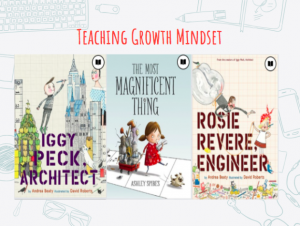 The first week, I worked with parents and students to understand the shift in pedagogy, and invited them to read some of these lovely picture books on Overdrive e library which would create the movement towards creative responses, and growth mindset. These books were used as “hooks” to bring in the discussion about art in science, engineering and PBL, and being curious about the world, as inventors and creative designers. I encouraged students to be inventors of their own questions and design something right off the get go. Each student came ready to share the following week either in our virtual class or on Flipgrid. Flipgrid allowed our students to present using video technology, and also view and comment on their classmates’ work. We spent a full hour listening and praising work effort with our student presentations. The socio-emotional learning was very evident when things did not turn out right. Check out this video of our student Davis sharing his Egg Picker Upper. He did eventually get it to work using some extra ideas and appendages. One of my students who experienced challenges with sharing orally presented his learning authentically using a sock puppet and shadows.